When August rolls around, it’s time to start thinking about Back to School…which means, among all the new clothes and school supplies, you need to start thinking of Back to School gifts for teachers! Obviously, it’s not mandatory to bring a gift for the teacher, but it’s a great way to start the school year off on a fun note! And most young children love giving gifts – especially if it’s one they’ve helped create. 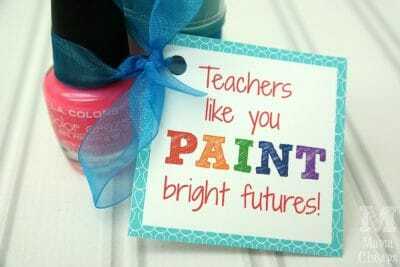 So check out our list of 10 easy homemade Back to School teacher gifts…hopefully you’ll find one that you love! If not, I’m collecting more ideas over at Pinterest, so check my Back to School Gifts board for more suggestions. I love easy gifts like this that are practical, fun, and affordable! Any teacher can always use soothing lip balm; and EOS lip balms come in so many fun flavors. Let your child pick a favorite EOS flavor (red, green or pink work best), print the card on cardstock, and just add the EOS. See complete directions at The Suburban Mom. Anyone who’s surrounded by a passel of kids all day needs a lot of caffeine to keep that upbeat and cheerful teacher voice going! 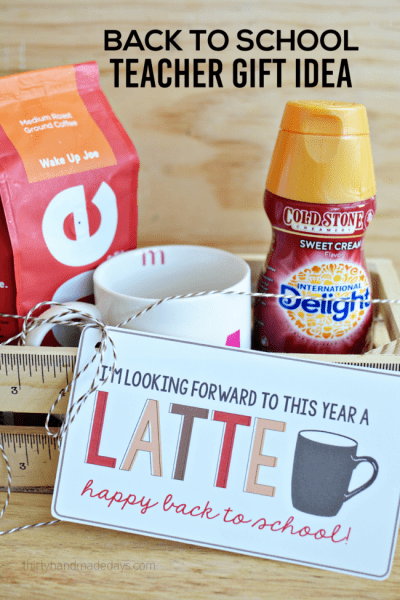 This adorable printable from Thirty Handmade Days works well with a little coffee gift basket like the one pictured above, or for an even easier gift you could attach it to a Starbucks gift card. Or you could fill a coffee cup with kisses or other treats…so many possibilities! 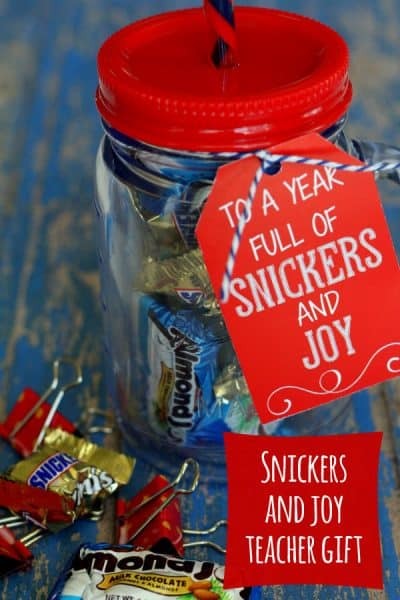 Get the school year started off on a “sweet” note with this adorable (and inexpensive) back to school gift idea that any teacher will love! Just fill a cute coffee cup, water bottle or jar, such as this adorable Mason Jar tumbler, with Snickers and Mounds. Use colorful string or ribbon to attach the card – which you can find here. And you and your kiddo can enjoy a few extra treats while making this little gift…and you know that calories don’t count if you’re doing a good deed! 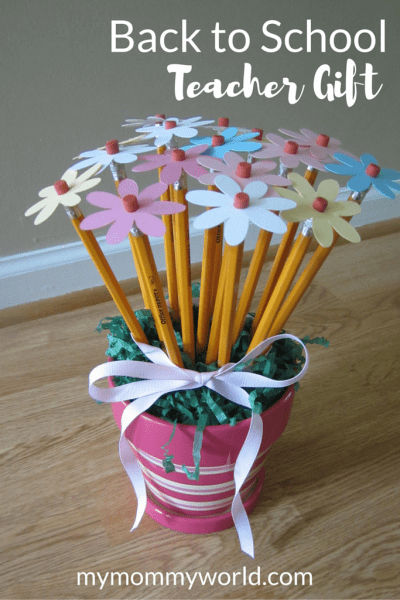 What a cute way for your child’s teacher to keep pens and pencils handy! Depending on how much time you have (and how involved your kiddo wants to be), you can use an already decorated flower pot or have your child decorate one. The flowers are made with a Cricut, but if you don’t have one, you can pick up styrofoam or cardstock flowers at your local craft store. Read the complete directions at My Mommy World. You’ll definitely look like a Pinterest-Perfect Mom with this adorable (and useful) back to school gift! 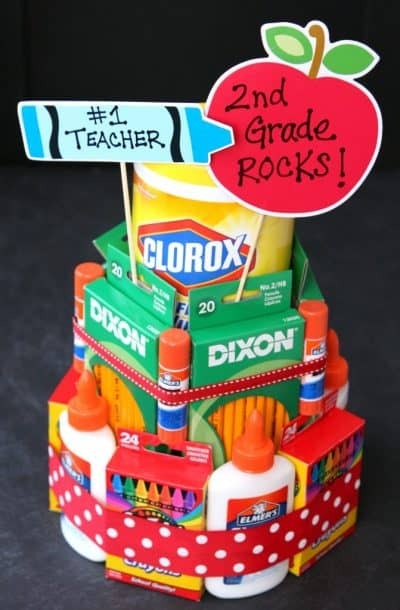 Teachers always need school supplies – and this is such a clever and cute way to give a practical gift. Once you’ve got the supplies you want to add, it just takes a few minutes to arrange the school supply cake. You can see the full directions (including a shopping list) at Happy Go Lucky. Another sweet start to the school year! Fill a mason jar with your favorite cookies (try this chocolate chip cookie recipe – it will change your life!). Pop a cupcake liner over the top of the mason jar for extra cuteness, and tie a matching ribbon around the edge. 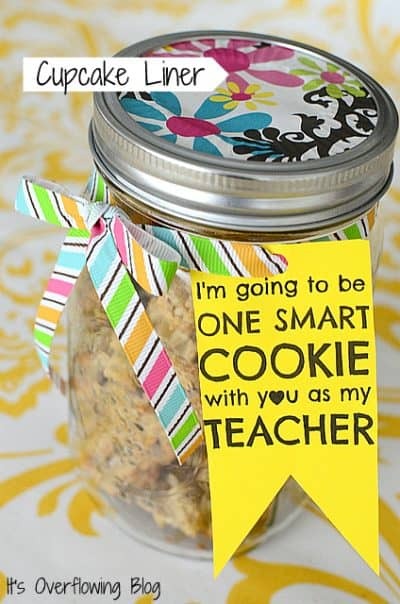 You can find the one smart cookie printable here. 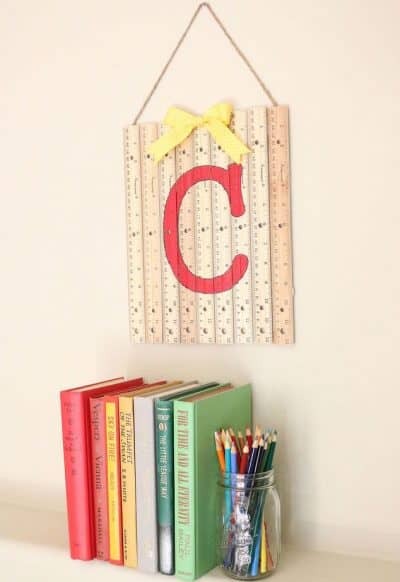 This fun ruler wall hanging takes just a few minutes to make, and your teacher will love hanging it in her classroom (seems like there’s always wall space that needs to be filled in a classroom). Be sure to take advantage of those back-to-school sales to pick up inexpensive rulers! Find the complete directions at Salt and Pepper Moms. 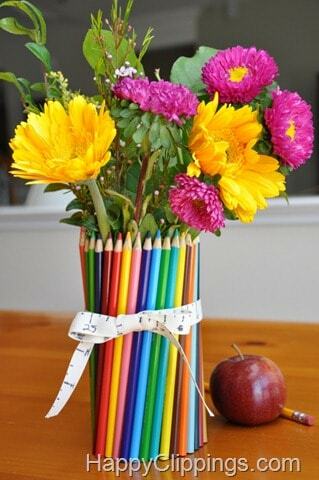 Any teacher would love to display her favorite flowers in this bright and cheerful colored pencil vase! 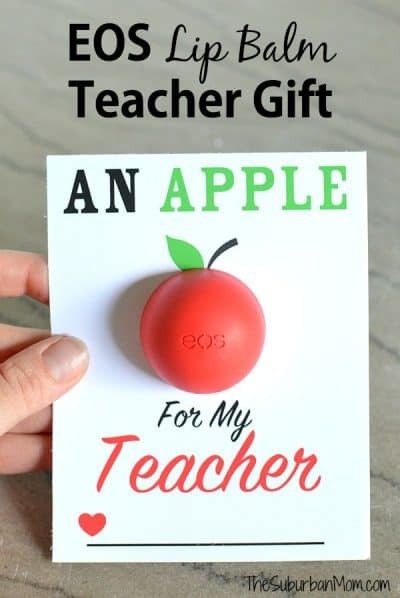 It’s also a practical gift as well…the pencils are attached by a rubber band, which means that the teacher and students can actually remove and use the pencils. Get all the scoop at Happy Clippings. Another fun and inexpensive gift that’s so easy to put together! The blogger at Mama Cheaps offers the printable and directions. You can find inexpensive manicure kits at any dollar store, Walmart or Target. Your kiddo would probably enjoy picking out a nail polish or two.